Bangor Police officers Chris Blanchard (left) and Jermaine Walker were instrumental in creating the new Critical Incident Team at the department. It is a peer support group that can help officers who went through highly stressful situations. The Bangor Police Department is establishing a team of officers trained to support their peers in the wake of traumas they experience on the job. Stressed-out cops pose problems for their colleagues in blue and the public they police, Officer Chris Blanchard said. As a result of their jobs, law-enforcement officers live at a higher risk of developing physical and mental health problems that reduce their life expectancy, according to a study by the International Journal of Emergency Mental Health. And in the United States last year, more cops committed suicide than died in the line of duty, according to a new study by the Ruderman Foundation. That troubled Blanchard, a 17-veteran of the department. So did knowing that stress can make a cop less fit for duty, and that few resources exist for police to talk about their feelings in a “macho” line of work where that has long been taboo, he said. His concerns came to a head in late 2015, when the 46-year-old worked three sleepless days in a row after he was the second on scene to a officer-involved shooting that put a fellow officer’s life in jeopardy and left a man dead, he said. And so with the help of fellow Officer Jermaine Walker, Blanchard pushed to create Bangor’s Critical Incident Stress Management Team. Going forward, team members will check in to make sure the officers are immediately OK within 24 hours of any call that has the potential to affect their mental health, Blanchard said. The officer or officers will then rehash what happened in a group setting. A policy that lays out the process is expected to become final by the end of the month, Blanchard said. At any point in the process, an officer can request a one-to-one conversation with a member of his or her team that shares the same rank, eliminating any concerns over group settings or talking to a superior, Blanchard said. That aspect brings the department in line with what Maine mental health experts say is the best way to promote police mental health, according to Jenna Mehnert, executive director of the National Alliance on Mental Health in Maine. 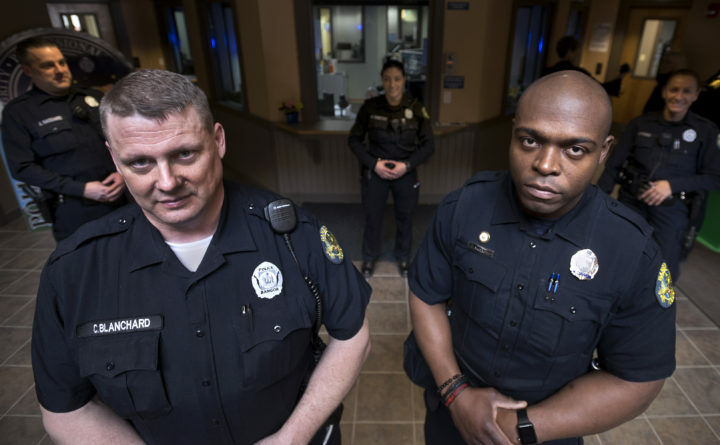 She said that while CISM teams have existed in Maine law for nearly a decade — the law protects officers’ confidentiality — they don’t outline or require a one-on-one response. To her knowledge, Portland is the only police department to offer peer-to-peer support services. In Bangor, seven patrolmen and two commanding officers have all undergone peer support training with a clinical social worker, which will be a mandatory requirement to join Bangor’s support team, Blanchard said. Eventually, Blanchard would like to make the team’s services available to departments nearby that aren’t large enough to create their own teams. The move would essentially establish the region’s first peer support service of its kind, where officers are there to help other officers. “We need to do a better job at taking care of our police officers so that they can care for our communities,” Blanchard said.